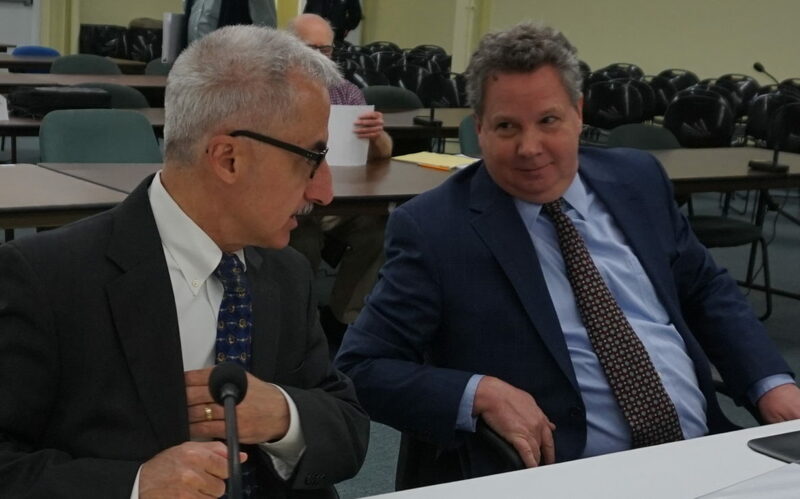 Attorneys Tom Pappas, left, and Peter Roth, Counsel for the Public, are pictured recently at a Northern Pass hearing in Concord. CONCORD — The Site Evaluation Committee chair ruled Tuesday to limit cross-examination by intervenors as adjudicative hearings on the Northern Pass Transmission Project enter the final stretch. Earlier intervenors said they would need 235 hours to cross-examine “friendly witnesses,” which would require an additional 39 days of hearings. Recently, the SEC added 31 more days of adjudicative hearings during October, November and December, not counting the ones scheduled for the rest of September. Project developer Eversource is expected to conclude its presentation next week, at which time intervenors will begin to present their witnesses. Terrence DeWan and Jessica Kimball continued testifying on Wednesday and are expected to finish on Friday. There is no hearing on Thursday. In March, Eversource sought to limit what is called “friendly cross,” and SEC chair Martin Honigberg said the issue would be discussed later, and has promised a ruling before intervenors began presenting witnesses. “The intervenors should expect that friendly cross-examination will not be allowed unless there is a demonstration it is necessary to a full and true disclosure of the facts,” wrote Honigberg in Tuesday’s order. The many intervenors — most opposed to the 192-mile, $1.6 billion, high-voltage transmission line running from Pittsburg to Deerfield — will have to file a list of witnesses they want to cross-examine and explain why by Sept. 22. The restrictions will not apply to the Counsel of the Public, which fills “an important statutory roll and serves an independent interest in representation of the public at large in these proceedings,” Honigberg wrote. The Sept. 22 deadline is particularly problematic for intervenors, said attorney Steve Whitley, who represents a number of communities including Pembroke and Deerfield. He said the deadline means they will have to decide who among all the remaining witnesses they intend to question in the next 10 days. Last month, Eversource again asked the committee to limit friendly cross-examination saying intervenors should offer proof they will not repeat points and not introduce testimony that should have been provided in written form. That motion was denied by Honigberg Tuesday. The request was opposed by many of the intervenors, including the Counsel for the Public Peter Roth, who said Eversource has been allowed to introduce new project information during the proceedings without regard to deadline and after pertinent expert witnesses have already testified and cannot be cross-examined. The Society for the Preservation of New Hampshire Forests also objected to the motion to limit friendly cross-examination raising the issue of due process rights. Will Abbott, forest society vice president for policy and preservation stewardship, said everyone involved has an interest in holding hearings as promptly as possible. He said the order will not affect his organization’s ability to present what it wants to present to the SEC, but also said expectations for filing intent to cross-examine may not be realistic. There may be some alternative ways to achieve what the chairman seeks so not every intent to cross-examine has to be filed by Sept. 22, Abbott said. Whitley said he understands the reason for the order, but “it puts the intervenors in a tough position.” He said the order limits what witnesses can be asked. “All the intervening parties will try to figure out how best to present our case in light of this order,” Whitley said. The order also gives intervenors — including the Counsel for the Public — two weeks after the record is closed to file closing briefs. Eversource has seven days to reply. The order also limits each intervenor group to one final brief. Intervenors had sought more time to file closing briefs. The 1,090 megawatt transmission project to bring Hydro-Quebec electricity to southern New England was first proposed seven years ago. The Site Evaluation Committee recently delayed making its final decision for five months. Instead of making a decision at the end of this month, it will now be delayed until the end of February, 2018.